If any of you are anxious about hosting this year's Christmas bash you may like to give yourself a break with the Christmas dessert. Instead of sweating over the stove praying for your cake to rise, why don't you cheat this year and assemble a dessert using ingredients from your local greengrocer styled in a beautiful way. Plate the produce beautifully and your friends and family will remember Christmas 2017 for the spectacular dessert you served. Interesting shaped glasses all the same size can be great for berries, cherries and lychees or you could use different glasses provided they hold a similar volume. 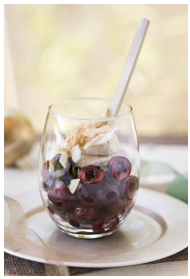 Keep your practical hat on and make sure your guests can get the spoon into the glass and the glass is not too delicate. Style and practicality is the game here - There's nothing worse than being served, for example, a meal with a sauce running off a flat plate, or on some dirty timber board which looks like a health hazard. 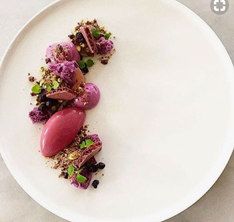 Food on white plates always looks smart but it can be a little boring. Consider colour by laying it on a coloured plate which matches the food or decorate the plate with washed leaves or flowers. Arranging the dessert into a nice geometrical shape is gorgeous, as it can be when you set the dessert off centre. Colour and texture complete the scene. We love the colours in raw pistachio which also add texture when they are chopped roughly and scattered over vanilla ice-cream with fresh blueberry and blueberry mousse. Another wonderful trick of cheatery. Source Italian biscuits or Pandoro and cut into circles. 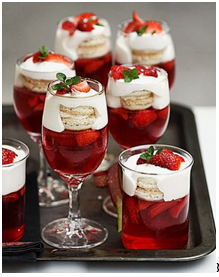 Top with cream and use the cream to "fasten" a pretty arrangement of berries to. Alternatively if you really must produce something you've cooked yourself - toast peaches or nectarines under the grill and top with a blob of mascarpone, a few shavings of candied orange and mascarpone. 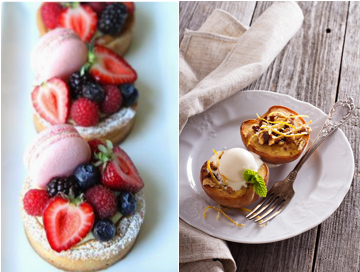 These are just a few ideas about how to style your dessert - Pinterest is an excellent resource for further ideas on food styling and table decoration.